G.SKILL presents two new extreme speed high-capacity DDR4 memory kits, the G.SKILL Trident Z DDR4-4266 64GB (8x8GB) and G.SKILL Trident Z RGB DDR4-4000 128GB (8x16GB) for the latest Intel® Core™ X-series processors and X299 motherboards. The new extreme speed kits use high-performance Samsung B-die ICs. G.SKILL validated the kits using the ASUS PRIME X299-DELUXE II motherboard paired with the Intel Core i9-9920X and Intel Core i7-9800X processors. Both kits support the latest Intel XMP 2.0 for easy memory overclocking. The G.SKILL Trident Z RGB DDR4-4000 CL19-19-19-39 8x16GB 1.35V is the fastest 128GB kit available for the Intel X299 platform. It is the ultimate memory solution for building a super performance computer combining the highest capacity and extreme speed. This kit will join the G.SKILL Trident Z RGB family and has been validated on the ASUS PRIME X299-DELUXE II motherboard and with the latest Intel Core i7-9800X processor. G.SKILL also presents the world’s fastest 64GB DDR4 memory kit with an extreme speed of DDR4-4266. 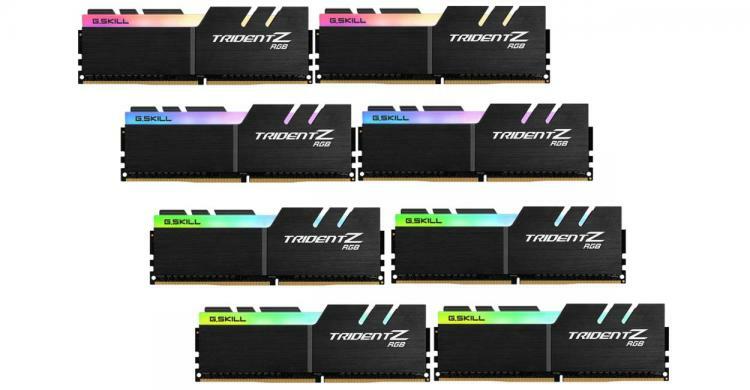 The G.SKILL Trident Z DDR4-4266 CL19-19-19-39 8x8GB 1.45V kit offers PC enthusiasts the perfect memory solution to build a high-performance PC for 3D rendering, multimedia editing, or other professional applications. The kit comes in the classic Trident Z black heat spreader. The kit was validated using the ASUS PRIME X299-DELUXE II motherboard with the latest Intel Core i7-9920X processor. The new extreme speed G.SKILL Trident Z DDR4-4266 64GB and Trident Z RGB DDR4-4000 128GB Kits will be available at partner resellers by Q1 2019.